I’m far too scared to get a tattoo myself. The pain, the blood, that’s enough to put most people off, but for me it’s the permanency of it all that really scares me. If my 16-year-old self had gotten her way, I would have a rose on my left ankle and a lightening bolt on my stomach. Something tells me I wouldn’t be so happy about those choices now. Regardless, I happened to find myself at Lucky’s Tattoo Parlour in Chapinero over the weekend. Located inside a beautifully restored colonial building with a pink façade and Billie Holiday tunes emanating from within. I arrived at Lucky’s with a far more outgoing person who decided it was time for some more body art by old school tattoo artist Sergio Cobra. 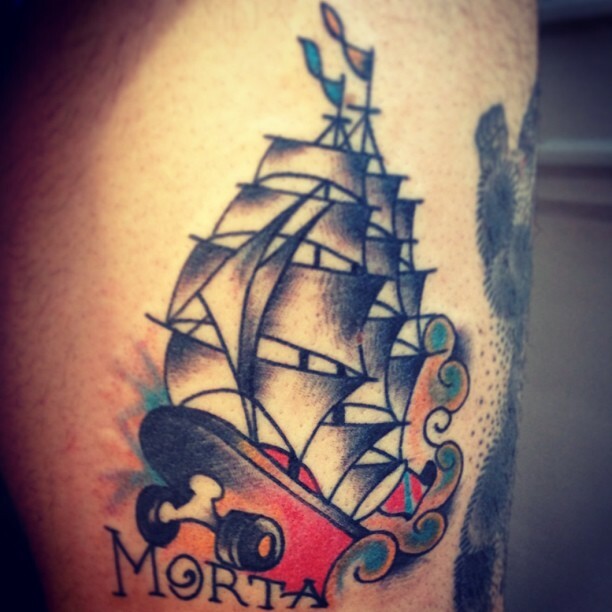 A business administrator by trade but with a passion for the painted body, Sergio is Bogotá’s answer to old school tattoos – think naked women, anchors and sailboats, thick lines, simple colors and a respectful nod at time passed. Inspired by the works of some of the old school greats like Bert Grim, Cap Coleman and Sailor Jerry and admiring the work of Steve Bolts and Mike Wilson, among others, Sergio started his tattooing career as a hobby. Working in the old school technique, Sergio did his time at Acid Ink Studio and Big Brother Studio, both in Chapinero, and Cobra Tattoo before opening his own space at Lucky Tattoo Parlour. He has also worked in several tattoo stores in the States. You can hear the buzz of the machines down the street and as I sat waiting for a friend to get a tattoo, I watch many others walk through the door, eager for Sergio to paint their skin with his needled brush. With framed flash designs covering the walls and the piles of books containing thousands of images of colourful designs, it’s hard not to leave this place without wanting a bit of ink on your skin. I’m sure my 16-year-old self would approve. Maybe some other time.